1. Keep your big stuff at the sides and back, so that they don’t hog all the water and detergent and keep it from reaching the other dishes. This will also keep them from blocking the detergent door. 2. Load the grungy side of the dishes toward the center so they get blasted more directly by the spray arms. 3. Use the top rack for plastic and delicate items, like beer steins and wine glasses. 4. Place glasses upside down on prongs to prevent breakage… and profuse adult language once discovered. 5. Silverware goes in handles down except for knives– load them handles up so you don’t slice your hand open when you pull ’em out. If your dishwasher has a big open basket, mix spoons, forks, and knives so they don’t stick together. 6. If some of your dishes have baked-on food, set ’em in the rack facedown and toward the sprayer in the bottom rack so they can get blasted clean. 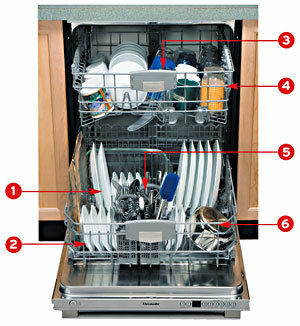 For more details on how to load a dishwasher, including water hardness issues, download this file.